Divides into thirds ... no math and no measuring! 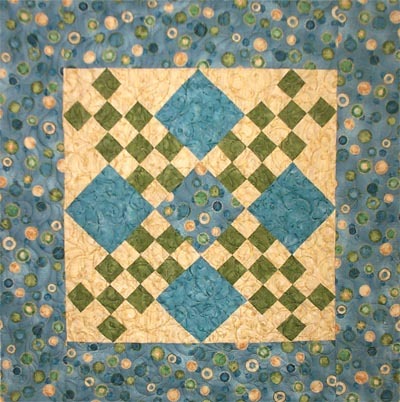 Nine Patch blocks are one of the most popular and versatile blocks in a quilter's repertoire. However, a key challenge in making them has been that to divide your starting squares into thirds requires math and measuring. (Quick: what's 8 divided by 3? And guess what? You won't find the answer of 2-2/3 anywhere on a ruler since rulers don't measure thirds of an inch.) Why limit yourself to only those small number of sizes where division by 3 is easy? With the CutRite Nine Patch Ruler, no math and no measuring is required! So, you can now make any finished nine patch block size from 3-1/2 inches to 9 inches! All those 5-inch charm packs and 10-inch layer cakes become perfect candidates for nine patch blocks. The ruler is a little under 12 inches long and consists of a beautiful transparent blue color that's easy on the eyes! To learn more about how this ruler works, read our simple instructions. or click on the button below to watch a short video. Make beautiful Nine Patch quilts, such as this one, fast and easy with the CutRite Nine Patch Ruler!